I have no idea what age I will need to be to be able to consider myself a woman rather than a girl, but I’m not quite there yet at 27… perhaps I’m kidding myself… Anywho, this was the easiest gift guide to put together because it’s basically just a wish list (in fact some of the items I am getting for Christmas). I may have got a little carried away with the list, but there’s no such thing as too many gift ideas for us females.. And if any of my family or friends wanna buy me one of these things I may love you forever, please and thank you. I’m sure pretty much every blogger out there has posted about the Hygge way of life by now. This is a brilliant little book and will look good on a coffee table as well – win, win! I’m not big on YouTubers’ beauty books in general but his one is so beautiful and filled with brilliant tips and useful information. So girly too! This cushion looks comfy and is totally instagramable (that’s so not a word yet, is it?). This is one of those things you look at and are like, why would I ever need this? But what’s Christmas if it isn’t a time for fairly pointless but totally cute gifts? Yes, a toothbrush has made it onto my gift guide… I am not even sorry. Dental hygiene is important, and when a toothbrush looks this gorgeous, I am justified in suggesting you buy it for that special person (who won’t take offence at a gift that mildly suggests they have bad breath). 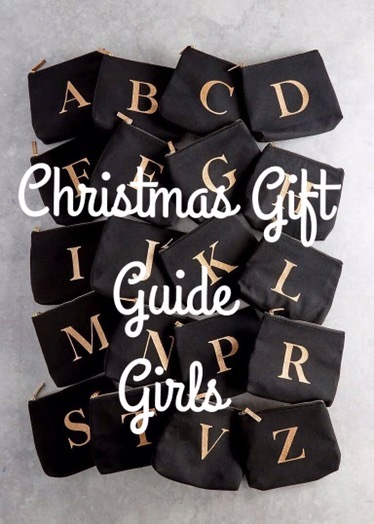 I saw these when I went shopping for a Christmas outfit for baby Benjamin and oh my god I would have bought them for every female I know if they had any of their initials in stock – argh, so pretty! And everything is better with your initial on it, no? I love a good red nail and lip and this gift set is beautiful. I’m getting it from my mum and think I’ll be cracking it out as soon as I open in on Christmas Day cos red = festive, whoop! How beautiful are these brushes? I mean, they are just gorgeous, so gorgeous that the idea of actually using them and making them dirty makes me feel a little sad, perhaps they could be just for show in a pretty little storage pot or something? They come with a case too, so nice! Ok so I totally wanted to feature my actual scarf, the one which I wear every single day and even some of the colder evenings when I feel a little chilly and need an extra layer… however, it would appear that one has sold out. This one is pretty nice too and if it’s anything like my one it will be super soft and snuggly – perfect to wrap up with during the winter months.